The Fellowship was fortunate enough to obtain a copy of THE SHRINKING MAN #1 from IDW Publishing. Ted Adams adapts the Richard Matheson story, with art by Mark Torres and colors by Tomi Varga. Scott is a regular guy with a wife, a daughter and a problem. One day he’s six feet tall, and the next – he’s shrinking. All science can tell him is that he’s losing about 1/7th of an inch per day. He’s had a lot of problems to face in the last few months, but right now he’s dealing with his biggest yet – surviving at 5/7th of an inch of height. Scott really is a normal American male, but he’s got an extraordinary problem, and we’re getting to know him through the lens of that problem (and through some helpful flashbacks). This adaptation does an excellent job of conveying that sense of character, which is central to the original story. The art really stands out as well, with very realistic size perspectives and a grasp of the details of the mid-20th century timeframe. The challenges of a “bigger” world is an important theme in our global culture today, so Matheson’s vision can be useful for all of us. And this title is a great way to experience that vision. 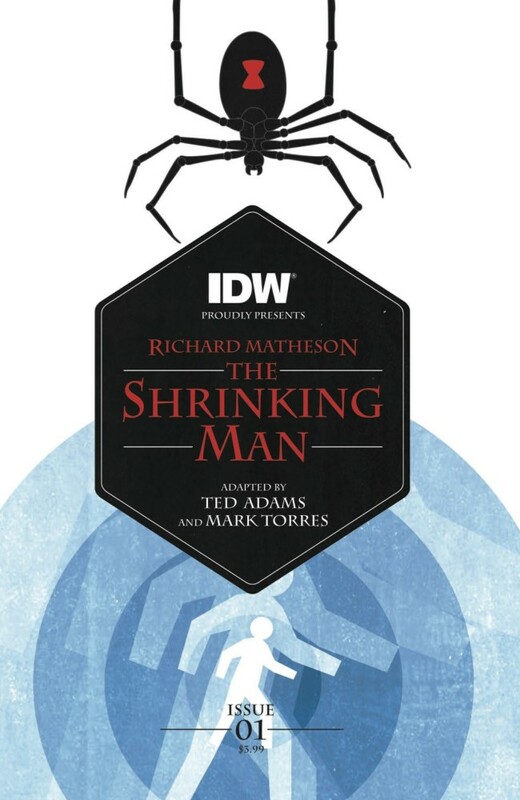 THE SHRINKING MAN #1 is available now at your FLCS or at idwpublishing.com.